Hands On Bike: First Look at Tern Bicycles! And here are some delicious pictures for you to drool over! Heat treated 7005 Aluminium, lightweight and strong! Frame latch with integrated safety latch, looks much cleaner and refined! Joints are forged for greater strength. 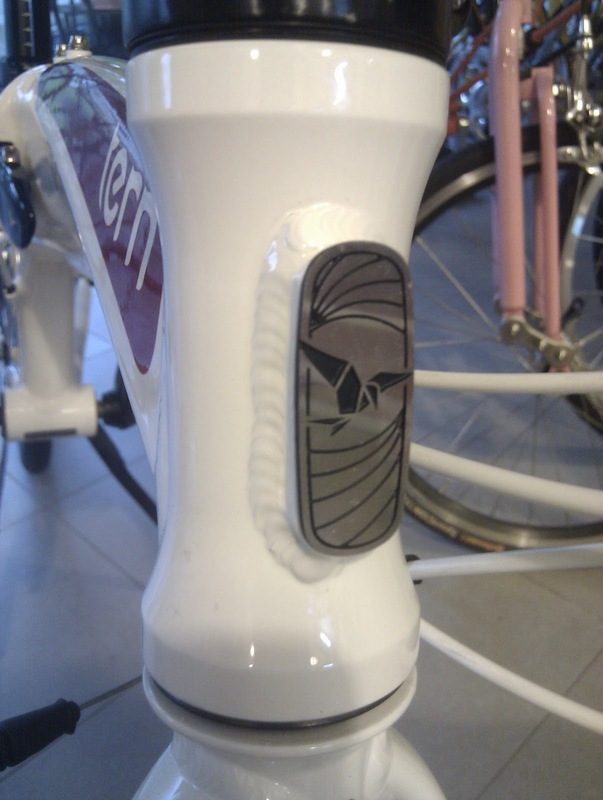 Head badge with the Tern logo. Remove to install your luggage truss! Front V brakes mounted on the rear of the fork, used to improve the routing of the brake cable housing. Instead of having a brake noodle to guide the brake cable, a plastic sleeve is used instead to curve the brake housing itself, simple and elegant solution! 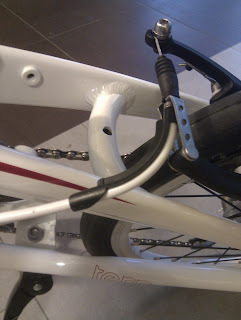 Rear magnetic catch is mounted on an external tab protruding out from the rear of the bike frame. And now for one of the most important part of the folding bike, the folding handlepost! Tern claims that it is stiffer and stronger than its predecessors, lets see how it looks. Handlepost when folded down. Latch rests nicely against the joint without protruding out. 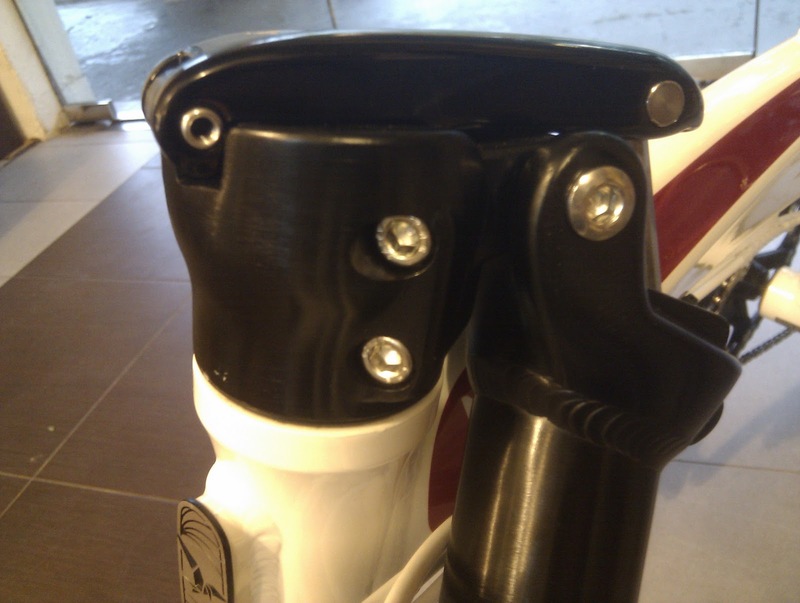 Notice the significant distance between the hinge of the handlepost joint and the base hinge of the latch, much larger than the existing handleposts used on Dahon bikes. This essentially makes the joint wider and larger, improving stiffness! Also, there is virtually no transition between the frame and the base of the handlepost, which mean that the handlepost is resting directly on the headset which is integrated into the head tube. Less parts mean less play which mean stiffer handlepost! There is practically no flex when the handlepost is put up, which is excellent. 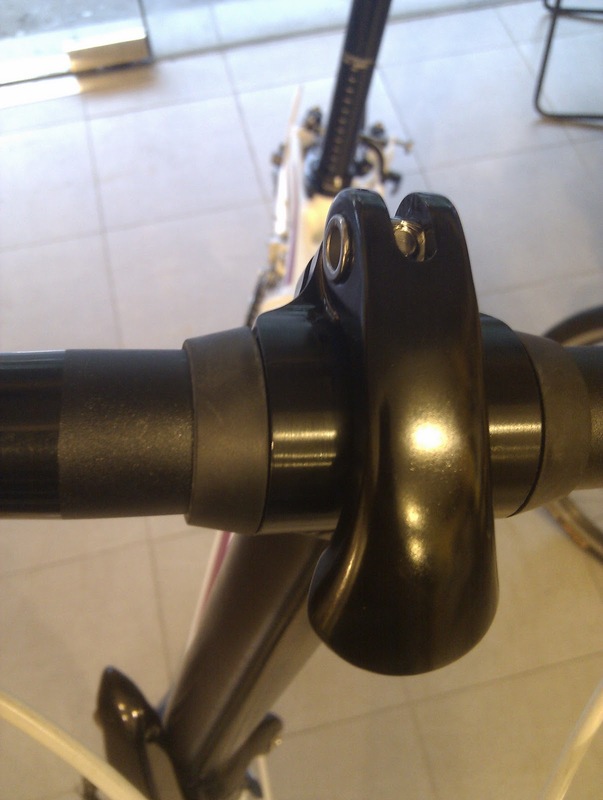 Top latch on handlepost that allows you to rotate the handlebar. 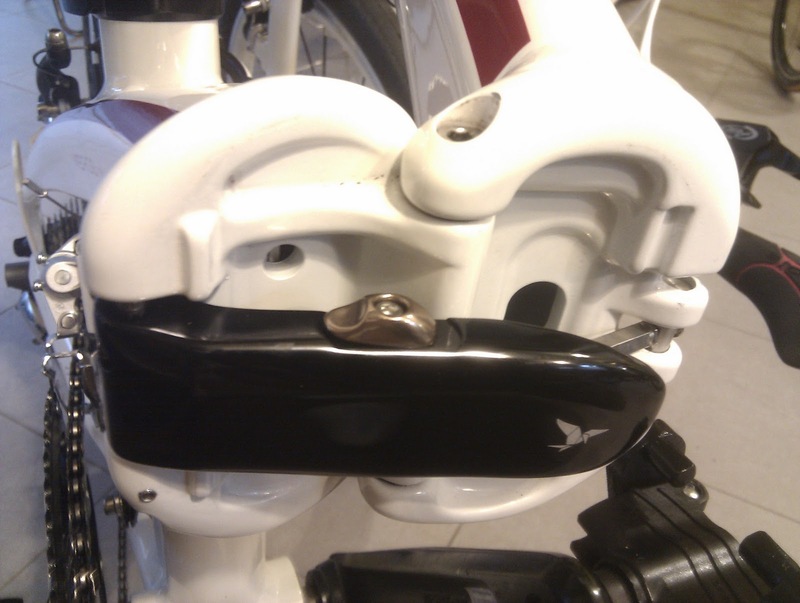 What I noticed for the top latch is that it is very different from the kind currently used on Dahon bikes. On the Dahon bike handleposts, the top latch has a hinge which opens up, allowing you to just remove the handlebar without sliding it out from the side. The Verge P18 when folded! The folding is similar to current Dahon Vector bike frames, which folds using the N-fold technology. Overall, the Verge P18 looks like a great bike that can do it all. Too bad I didn't get the chance to try out the bikes yet, it would have been great to see whether the Tern bikes really have greatly improved stiffness! Rear dropout on Link P9. No external gear hanger! The Link P9 has no external gear hanger which allows you to use your own rear derailleur. The stock Neos rear derailleur is pretty good, and the bike is already 9 speed, so you may not want to upgrade. 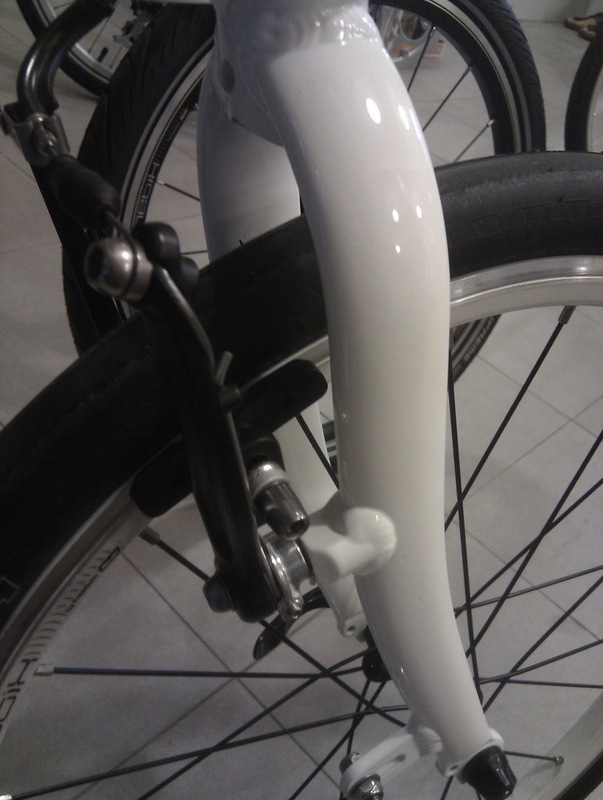 However, I feel that this subtle difference may surprise some people when they try to upgrade their bikes! At least for the Dahon Vitesse D7 or the MuP8, there is an aluminium dropout piece that you can change to have a rear gear hanger. But the Link P9 frame does not have any provision for a DATT rear derailleur. Rear dropout on Link C7. Comes with a gear hanger for you to install your preferred rear derailleur! 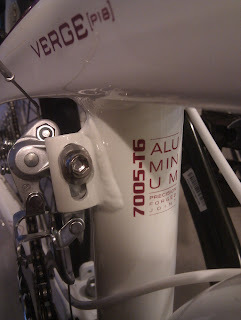 At least the Link C7 frame has the gear hanger, so it is possible for you to use your own rear derailleur. Of course, if you plan to upgrade the Link C7, you will first have to change the wheelset to a 8/9/10 speed compatible one, but at least you can use your own rear derailleur. In that sense, the Link C7 frame is more upgradable than the Link P9 with respect to the choice of RD. It has been an interesting and exciting trip to MyBikeShop. Will update with more juicy details when I finally get to try out the bikes! Went to try out the Verge P18 today! The Verge P18 is a great bike that can do it all, very similar to the Dahon Vitesse P18. It has premium components, has double chainrings for steep hills and also for speed, and it is equipped with flat handlebar road bike components on it. Took the Verge P18 out for a spin, and I was quite impressed by it. During testing, I stood up to pedal hard, I pulled and pushed hard on the handlebar, and basically tried to flex the frame. All this hard work just to test the stiffness of the bike! The frame feels solid as always, similar to the Dahon frame stiffness. This is probably because the frame stiffness of the Dahon bikes is already pretty good, so it is quite difficult to improve much on it. Perhaps a heavier rider will feel a greater difference in the stiffness of the frame? The new Physis Handlepost on the Verge P18 is beyond awesome! With the massive joints and hinges, together with multiple patented technologies, the stiffness of the new handlepost is every bit as good as they claim. Even when standing up to pedal or wrestling hard with the handlebar, there is practically no flex at all! As hard as I tried to flex it, it does not yield and the stiffness virtually feels the same as those on a full sized bike. If you are a powerful rider who likes putting on power through the handlebar, this Tern handlepost will handle the abuse you throw at it. Even for me, who is using a Dahon one-piece handlepost, this new Physis handlepost made me go wow with its excellent stiffness and strength. Don't just take my words for it, go try a Tern bike for yourself to find out! when i go above 27km/h on my MU P8 the front of the bike starts to have sound.. is there something wrong with it? Hmm very hard to say what's wrong. if you cannot pinpoint it, best to bring to bike shop for them to analyze, they have lots of experience and can help to solve it. 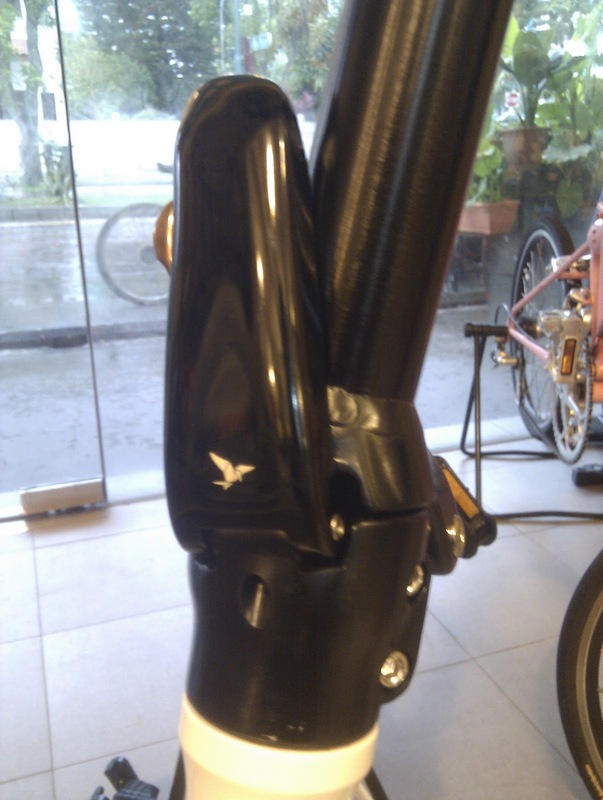 Do any of the Terns fold up so that the handle post is between the front and rear wheels, like the Dahon Speed P8? 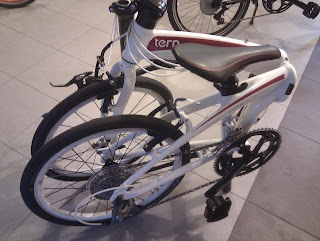 Nope, the Tern bikes use the N-fold technology, such that the handlepost folds down on the outside. 3) in case i will sell it ( because i will never sell the Flamingo), which bike can command a higher percentage of re-sale over purchased price. Sorry for the many questions but I feel you are the person who can help me. Thanks a lot! The hammerhead is a really fast bike, as close as you can get on a folding bike. both bikes wil satisfy your requirements. however, there are some differences. for compact folding, the Verge P18 is still better. the hammerhead only folds in half, can transport in car but difficult on public transport. If folding is not a key factor here, get the hammerhead. you can even get drop bars for a more road bike feel. try out the bikes if possible. if resale value is a concern, the Verge will probably be better as it is newer. I would suggest the Dash over the P18 if you are going for speed. The Dash has a stiffer frame which really enables you to push hard for speed. What you lose out will be the more compact folding of the P18. I have a vitesse D18. Stock. The ride is good. I intend to get a mu 24 form Taiwan next month as there is a good deal. But I understand the front gear are internal hub. What does that mean? Also the front is only 48T. Does it mean is not as fast as vd18? Can internal hub be upgraded to 55T? I also have offer for verge p18. Price sgd200 more than mu24. Which is a better deal? MuP24 has 24 speeds, in the form of 3x8 speeds. 8 speeds is supplied by the RD, and the 3 speeds is in the form of a 3 speed internal hub. There is no front derailleur. With the internal hub, the 48T front chainring is more than enough, as the internal hub can give you higher gears. If you change to 55T it will be too hard to pedal. Tern Verge P18 is better as the frame is nicer and lighter in weight than the MuP24. Easier to upgrade the P18 as you can upgrade the FD or wheels easily, unlike the MuP24 with the internal hub and no FD mounting. Sorry. I mean link p18. Not verge. Which is a better buy. Hmm I don't know of any Tern Link P18. they don't have such a model. Yes the MuP24 internal hub bike can go as fast as your D18. In fact the Vitesse D18 is a good bike to upgrade. Tern Link P24H and Dahon MuP24 are very similar la. Basically the same bike. Frame looks a bit different only. For my vd18. I'm looking at upgrading the crank and brakes. Other prts looks quite decent. Maybe some small thinks link seat post and small cosmetic upgrade like color screw. Do you also know if there is any good folding or quick release pedal? The MKS FD-7 is a good metal folding pedal. smooth and reliable. Upgrage Tern P18 to 451 wheelset, how should i mount my brakes??? Should i use road long arm calipers or vbrakes with extender (where can i buy extender in sgp)?? Thanks,. Since you have 451 wheels, you can use normal road caliper brakes. No need for long arm brakes. Just to make sure, go to a bike shop with road caliper brakes and try fitting it and see if the brake pads can reach the rims. Good blog.... so much to read... :) By the way, I'm considering a Verge X10 and may also consider a Verge P18. Any comments about the 2? Both are good bikes. X10 is a fast bike, with good components and wheelset. But more expensive. P18 is a do-all kind of bike, with decent wheelset and components. Can be easily upgraded to X20 level at a lower cost than stock X20 bike. Any suggestions for all the good components to upgrade it to a X20 level? Thanks! Will love my P18 to tern to X20 performance. The main difference between the P18 and X20 are the wheels, drivetrain and shifters. These can be easily upgraded to top end components. For wheelset, Wheelsport is a popular choice now. Light and durable. Cheaper and possibly stronger than Kinetix Pro. Fast tires such as Kojak, Durano or Ultremo will make your bike really fast. A good solid crankset such as Ultegra or even Dura Ace will be really good. Upgrade to a 2x10 speed road system and you will reach or even exceed the X20 specs. Ultegra RD with 10 speed cassette and front double FD, plus R780 shifters will be really good. Best of all, these will cost less than the X20 and you get to choose exactly what you want. If I really want to exceed the X20 level on my P18, what is the Best possible exact combinations you can recommend? Will using SRAM crankset be a good choice? I'm open to all types of different combinations as long as it exceed far beyond the X20 level with speed and performance. Thanks! If you want to upgrade the P18 to be a top level bike, you must be prepared to pay quite a bit, perhaps more than the X20. As you said, you want the bike to "exceed far beyond the X20 level with speed and performance". That is possible, and I can suggest some top level components. But first, I will need to know what type of components you are looking for. 1) 10 or 11 speed? 11 speed will entail building a wheelset from scratch using the newer 11 speed rear hubs. I will be recommending Shimano parts as they are known to be widely compatible and durable at a good price. I'll be using flat handlebar because I want it to fold easily and let it stays compact. Any combinations of top components that perhaps not exceed the price of the stock X20 but can definitely out-perform the stock X20? Which will you recommend in terms of bang-for-buck? 10 or 11 speed? I'm also looking into the top components that's easily maintained compared to getting the top-notched components but hard to find any spares if something goes wrong. My recommendation is 10 speed for now, easier to get parts and are not so expensive. In any case, no 11 speed flat handlebar shifters available yet. I will list down the components one by one. 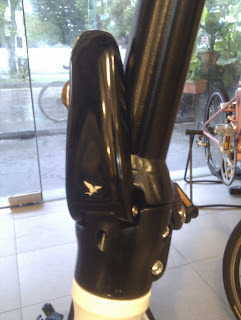 Seatpost: KCNC or PZ Racing Carbon. But Aluminium Litepro ones are good enough. Wheelset: Kinetix Pro or Wheelsport. Kinetix for super light but not as durable due to less spokes. All these are top end components that have been proven to be durable. If you find Dura-Ace too expensive, you can get Ultegra components, which have 80% of the performance at 50% the price. All these components should last you quite a while, after all they are used by professionals over thousands of kilometers. I will definitely keep this list and upgrade it one by one! I don't need the seatpost though because I feel the stock seatpost is good enough for me. Is it possible to use back the same handlebar? I find it quite comfy for my preference. the stock seatpost is strong, but a little heavy. It is good for those who are over 80 kg. stock handlebar is fine, no problem. For the tires, do you think 451 is better than 406 for my P18? if you go 451 wheels, it will be more tricky to install V brakes. adaptors will be required. 451 tire choices are also more limited. with 451 wheels there is no space to install proper fenders. both sizes are fine, it is your choice. Found your interesting blog yesterday. Lots of great info, thanks! Mu SL is not common nowadays as it is a limited edition bike, the last version was in 2010 I think. If you want to upgrade, you need to start with a good light aluminium frame. Mu P8 frame is pretty good as it is quite similar to the MuSL frame. Mu Uno itself is already quite heavy, even though it only has 1 speed. It is difficult to upgrade it as the rear dropout width is non standard, and so are the wheels. Nowhere to mount a rear brake reliably. Not recommended for upgrading. If you want 9 kg, you will need to spend more than 1k. 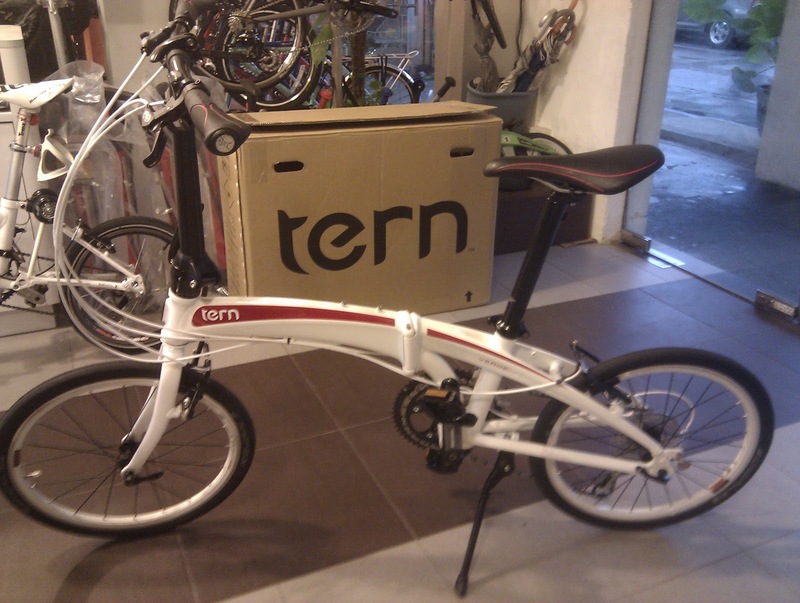 Even the stock Tern X10 is almost 10kg, and it will cost close to 2kg second hand. A light wheelset such as Kinetix Pro already costs $600, a lightweight crankset another $500, and it already exceeds 1k without even the bike. I think Dahon is a good choice. Get a frame that you like, and you can modify it accordingly. 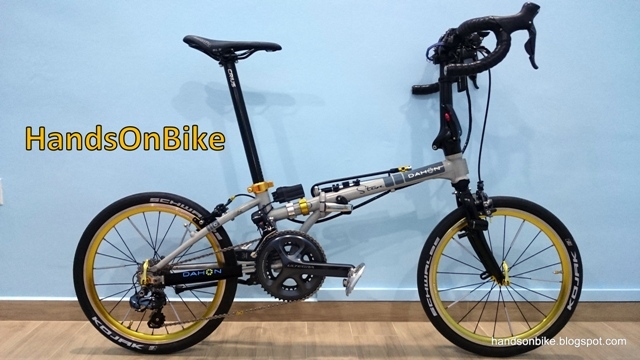 You should be looking at at least $2k for a lightweight folding bike of less than 10kg. Thanks again... look like may just have to wait for some one to sell his old Musl. To reduce the weight from the stock 11.6kg to 10kg is actually not too difficult. The difficult part is reducing it further. You can check out this article to see the weight comparisons for some popular components. First of all, change out the wheelset to perhaps Kinetix Pro (-400g). 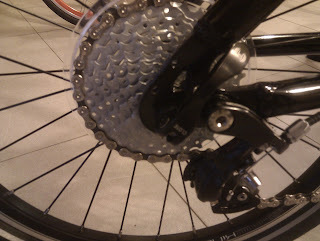 Upgrade crankset to Shimano 105/Ultegra (-300g), lighter pedals (-200g). Upgrade RD from Tiagra to Ultegra (-100g). Upgrade seat post and saddle (-300g). Drop the kickstand (-200g). This will cut the weight by about 1.5kg. However, just take note that the accessories that you add on (lights, speedometer, water bottle, saddle bag, tools, etc) will just add back the weight. Thank You for your suggestions, how much will it cost if I upgrade crankset to Shimano 105/Ultegra (-300g), lighter pedals (-200g). Upgrade RD from Tiagra to Ultegra (-100g). Upgrade seat post and saddle. For pricing, you need to check with the local bike shops or online shops. Kinetix Pro wheelsets are already the lightest you can find, at about 100g lighter than Wheelsports. Hi Steve, I was looking at your recommended upgrade for Verge P18 and I have a few questions which I hope you will be kind enough to answer. I'm very new to this bicycle thing but I'm willing to take up to challenge to learn how to change my part and maintain my bike on my own. I've tried looking at Verge 18 manual but can't get much information in terms of specification. Sorry if it is such a long questions and thank you in advance for your effort. Great to see that you have done the research! I will be happy to answer your questions. 1) You will need the bar mount type, else you can't mount it on the handlebar. I-Spec A or B is for mounting to the brake lever clamp band directly. In any case, I suggest you use road shifters since the other components are all road components. SL-R780 2x10 shifters will work nicely with 10 speed road components. 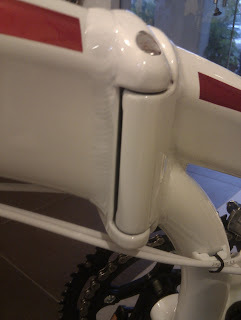 2) Get the braze on FD, it mounts on to the FD hanger on the P18 frame. No need sizing as it is not band on type. 3) Yup short cage road RD as it is used with a front double crankset. 4) Get the 53/39T crankset, as it is the most standard size. The larger 55/42T may give a gearing that is too high. 170mm is the most common and standard length. 5) Yes you need English thread 68mm for Dahon / Tern frames. 6) 11-28T road cassette seems good for all round performance. 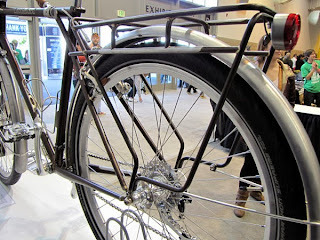 7) Either length is fine, both are long enough for folding bikes. Thank you so much for your kind reply. Was not expecting you to reply so soon but nevertheless it is nice. Honestly I didn't know you can learn/do so many things with cycling/bike, always thought just buying one bike and cycle but when you jump into the details and the kind of upgrades you can do, how good parts make your riding much easier and smoother, the tuning that can change the whole cycling experience and so on, things are getting very interesting! Thanks again. Really appreciate it! Sorry Steve just 2 more questions. 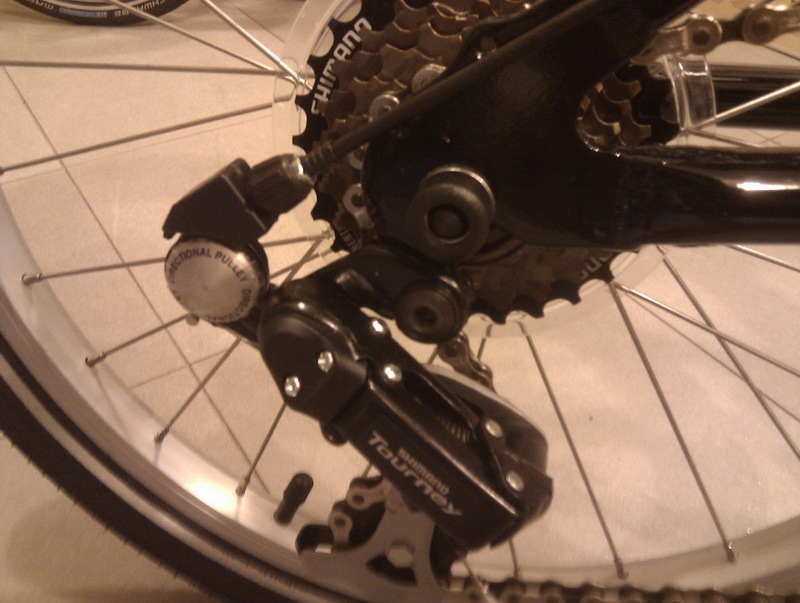 1) The V brake, the only one I can find for this kind of V brake is Shimano XT V Brake T780 http://www.chainreactioncycles.com/sg/en/shimano-xt-v-brake-t780/rp-prod70102. Correct me if I'm wrong, I will not be able to use the caliper kind of brake as my P18 fork is not design for that. Same goes with disc brake too? 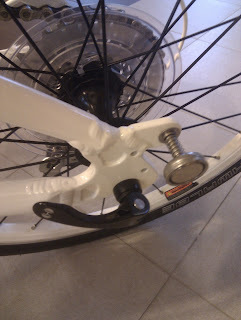 XT V brakes are good, there are also LX and Deore grade of V brakes. It is possible to use caliper brakes, but you need long reach types such as Tektro R559. I would suggest using caliper brakes only if you use drop bar road shifters. Else V brakes are just as good. As for brake levers, there are also XT, LX and Deore grades. Do you happen to know the size of Verge P18 rear hub? Is it 130 or 135mm in size? Also I saw in one of the reply you mention that if we change from 406 to 451, we might have problem with the v-brake, so is caliper brake recommended? The width of Verge P18 rear hub is 130mm. 451 wheels are larger and so standard V brake calipers cannot be used without adaptors. Caliper brakes would be possible but mounting may not be easy. Hi Steve, enjoyed reading your blog for the past whole week! just got me hooked. There are few things that I like about this bike, the 'apple tini frame color, the red wheels and 18 speed. My future plan is to build/upgrade to a fast foldie bike for commuting or may be even join racing (pls dont laugh haha). is this a good bike to start off which enables upgrades like SRAM DD3 for 30 speed, quality RD's, bull/drop bars, high profile wheel sets and some solid braking power? If you are looking for a bike which can use the SRAM DD3, you are better off getting a bike which already comes with the 3 speed internal hub. Examples are Mu P27 or Vector X30 or Verge X30. These bikes also have bullhorn bars which are what you want. 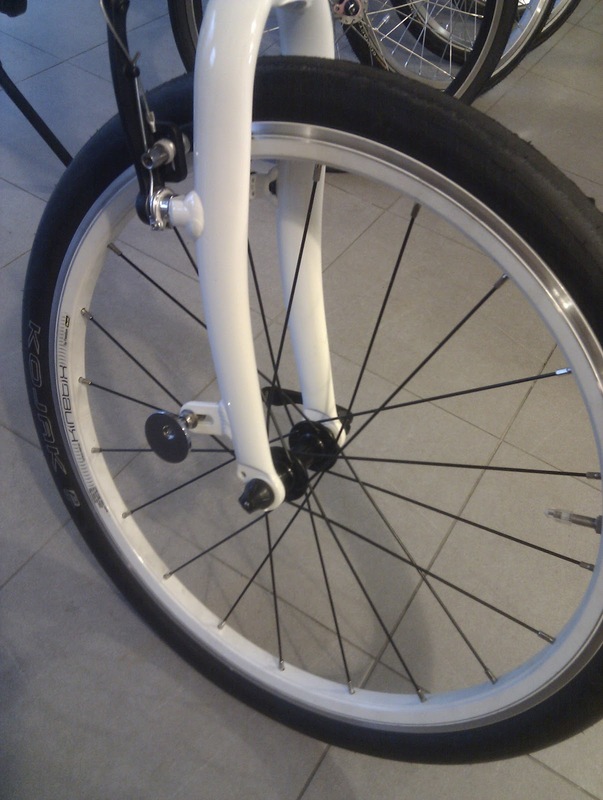 If you want a high profile wheelset with DD3, then you will need to buy the rims and custom build the rear wheel. Yes you're absolutely right! but I guess I wasn't clear enough.. I have budget so I dont think I can go for a high end bike at the moment, 1K is the max I'm looking to spend now and upgrade when time permits to get additional upgrades. So was wondering whether Visc D18 would be a good project bike to upgrade with high end or 2nd tier/mid level components? To be honest I viewed the bike couple of days ago and just fell in love with the color scheme, even Dahon Horize has a similar color and a kinda cool frame design too. I'm not sure what I should be looking at in a frame which is suitable for upgrades in future. The Visc is a good frame that can be upgraded nicely. Most items such as high end components and bullhorn bars can be changed, but the DD3 will be difficult and is not recommended. thanks again for your reply, Steve! I'm looking at getting one this week and hopefully train myself to use it for commuting which is about 20km. With that in mind, any tips or specific things that I should look in to when purchasing? All other parts can be upgraded. I am planning to get a bike to cycle to work (first timer) and is looking at the dahon speed D8 or Visc D18. Which bike is more recommended? Which other bike will you recommended for a budget of $1000? Thanks! I would actually recommend the Tern Verge N8. It has a good frame and decent specs, and can be upgraded very easily. The Verge Duo cannot be upgraded to multi speed due to limitation in frame design. Will be tough going uphill with only 2 speeds. If you want 20 speeds, you can get Verge P20. Or get Verge P9 to upgrade in the future. Already replied in the above post. Verge Duo not possible to upgrade to multi speed. I think it is just glued on or snap fit on. If lost or damaged, just ask the dealer to see if they have any extra lying around. Hi looking for first folding n finding this tern verge n8, it's good m upgradeable? This is a good bike for upgrading as it has a good frame and folding parts. Try changing the metal shim inside the seat tube for a more fitting one. One of the parts (seat post, shim or seat tube) is out of spec, which will cause insufficient tightness. huh, I hadn't noticed a shim whenI looked down the seat tube; I'll take a look. Thanks for the idea. augusto. If the N8 frame has a mounting point for the front derailleur, then the N8 might be the better choice, as you will not be getting unwanted components. Both frames are similar, so just go with the design you like. 1.so the n8 has no mounting point for the FD? if it is, then the p18 would be my choice. 2. does the n8 frame compatible with 10s cassette? 3. pls give recommendation on mid lvl cranksets that are not sealed bearing. ( i mean the bb is hollow tech). You need to check the actual N8 frame to see if it has the fd mounting, as i am not too sure. The N8 will be OK with 10 speed, since freehub body is same for 8, 9 and 10 speed cassettes. Are you looking for crankset with Hollowtech Bb? Mid range would be Tiagra or 105 for 10 speeds. Alright Steve, those info would be helpful. Il keep reading these blogs here for sure.